What’s better than a delicious ice cream cone on a hot summer day? A calorie-free ice cream cone that can be enjoyed all year long! 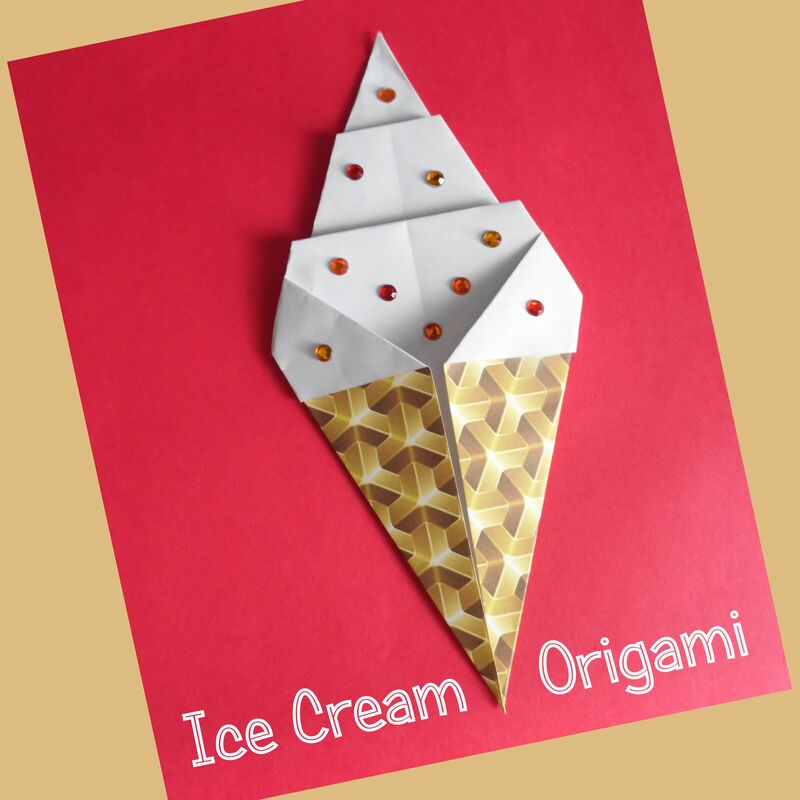 Origami ice cream cones are easy to fold, which makes them the perfect craft for introducing children to the art of paper folding. You can also use origami ice cream cones as inexpensive decorations for a picnic, birthday party, or ice cream social. The origami ice cream cone is made with a single sheet of square origami paper. Both sides of the paper will show in the finished design, so a sheet of paper that is tan or brown on one side and white on the other side is ideal for this project. You can also use a sheet with a striped or cubed geometric pattern. The paper in this tutorial is from the 900 sheet Geo-Gami paper pack by Sterling Innovation. If you do not have origami paper handy, you can color one side of a sheet of white copy paper brown before beginning the project or use a glue stick to paste together two different colored sheets of construction paper. Review our How to Make Square Origami Paper article for an easy way to turn a letter or legal sized sheet of paper into a perfect square. To make a kite base, start with the white side of the paper face up. Fold the paper in half along one of the diagonals to make a large triangle shape. Unfold. Fold the left and right corners in to meet the middle crease so you have a shape that resembles a kite. Fold the left and right flaps down and out to form triangles that extend past the edge of the kite base. Tuck the flaps from the previous step behind the paper. This finishes the base of your origami ice cream cone. Flip your paper over. Fold the left and right corners in to meet the center vertical crease. This finishes the “cone” part of the project and begins creating the “scoop” part of your origami ice cream cone. Shape the “scoop” of ice cream by folding the top of the paper down and then up. Make a second accordion fold in the same manner at the base of the “scoop” to finish shaping your origami ice cream cone. Flip your paper over. If you're using solid colored paper, draw lines on the tan or brown part to make it resemble an ice cream cone. If you don’t want “vanilla” ice cream, use crayons, markers, or colored pencils to make the ice cream scoop the appropriate color. If desired, you can also add sprinkles to your ice cream cone using crayons, markers, colored pencils, or small self-adhesive rhinestones.